Add the white wine to the lamb stock in a large saucepan and reduce by half over a high heat. Remove the pan from the heat, add the rosemary sprigs and allow to infuse for 20 minutes, then discard the rosemary. In the meantime, put the sliced onions into a saucepan with the olive oil. Place the pan over a very low heat for 30 minutes or until very soft, stirring occasionally. Drain the onions, discarding the oil, and put to one side. Preheat the oven to 180ºC, gas mark 4. 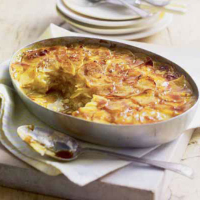 Grease the bottom of a shallow, ovenproof dish with a little butter then line it with a layer of potato slices. Season with salt and pepper then scatter a few onions over the potatoes as well as a few curls of butter. Repeat this process with all the ingredients, making sure there is a little extra butter for the top. Bring the lamb stock back to the boil and pour over the potatoes, cover with a piece of baking parchment and place in the preheated oven for 15 minutes; then reduce the oven temperature to 150ºC, gas mark 2, and cook for another 35-40 minutes. 5. Check the potatoes every 10-15 minutes and press down the top layer with a spatula to ensure even cooking. Remove from the oven, take off the parchment and allow to rest for a few minutes before serving.